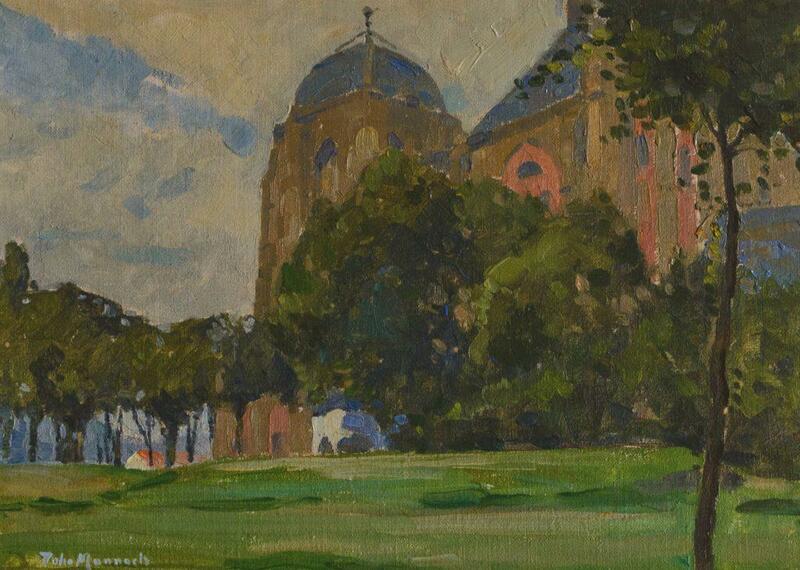 ‘The Great Church at Veere, 1914’ by John Munnoch (1879 – 1915) is a recent purchase for the Stirling Smith collections, made possible by grants from the National Fund for Acquisitions and the Common Good Fund of Stirling. Scottish artists were well acquainted with Veere, as from 1541 it was the Scottish staple port for trade, and to this day, cultural ties remain with Scotland. Munnoch was born in Port Street, Stirling and attended Craigs School and the High School of Stirling. He studied at Edinburgh College of Art where, in 1912, he gained the Carnegie Travelling Scholarship and the Maclaine Watters Medal. The following year he won the Keith Prize for the best student work exhibited that year at the RSA, and again the Maclaine Watters Medal. Munnoch was one of the most talented artists of his generation. This was possibly one of the last works he painted before he enlisted for active service with 5th Battalion, Royal Scots and was killed at Gallipoli in June 1915. His name is on the Stirling War Memorial, and at this time of year we remember the massive loss of life, energy and artistic genius caused by the Great War.